As I mentioned in my review of Montreal’s Fairmount Bagel a few years ago, bagels are generally a fairly regional food item, with various world metropolitan areas all having their own variations on the same theme. One of the more respected ones, the Montreal Bagel, is also one of the most regional: it’s rather difficult to find a proper “Montreal bagel” outside of Quebec (and heck, they get pretty scarce outside of Montreal itself). So it was with a bit of skepticism that upon hearing that a relatively obscure member of Burlington’s bagel scene (which, to date, hadn’t really impressed me that much, even with the relatively low standards I’ve had for “New England” bagels), we noted them to check out sometime. But a trip this summer by Carol up to Burlington to get an issue with her Mini Cooper fixed let her to try out Myer’s Bagels, and she came back excited: “They really are good, Montreal-style bagels”. So the next time we were both up in Burlington, it was time to check out Myer’s. One thing Myer’s actually has is pedigree. 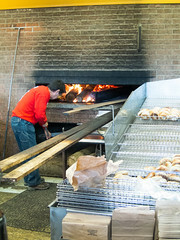 The head baker, Lloyd Squires, learned the tradecraft of making Montreal style bagels in Montreal, working extra shifts for Jewish baker Mijer Lewkowicz (the namesake for “Myer’s”). Eventually, he decided to come to the United States, and ended up not too far over the border. He’s been making bagels around Burlington for years, mostly in their bakery hidden in an industrial area off of Pine Street (now an up-and-coming area, with new cidery Citizen Cider being practically a neighbor now). 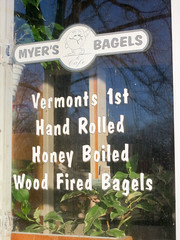 The signage is minimal, so, if nobody had clued you in about the great bagels Myer’s has been making, you could easily miss the small signs on Pine Street. But walking in the door at Myer’s, you can immediately tell that this place has the potential for a really good Montreal-style bagel, since it looks like a Montreal bagel shop; it’s almost the spitting image of Fairmount or St Viateur, with a busy bakery floor surrounding a Montreal-style bagel oven: a long, narrow, wood-fired oven upon which very long boards of twisted and boiled dough are baked until they become, well, bagels. 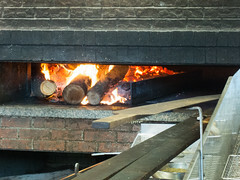 You can see the staff busy kneading, boiling, twisting, and baking. Meanwhile, you can walk over to the counter, and either buy some bagels, or, in a somewhat newer addition to the business, get some sandwiches. I quickly decided to try a fairly unique one: the “Montreal Spice bagel”, a Montreal-style bagel with a rich dusting of a spice blend including cumin, coriander, salt, pepper, and, well, a few secrets. We got a half dozen of these, a handful of sesame, and a dozen plain bagels. And I’ll have to say, these bagels truly are the real deal: the smaller, slightly denser, and slightly darker-cooked cousin of the more-known New York bagel, these were also malty, chewy and delicious. While I still have a love for Fairmount and St Viateur, the bagels at Myer’s are no slouch, either. They aren’t an approximation of a Montreal bagel, but a proper, true Montreal-style bagel… just one that happened to be made over the border in Vermont. 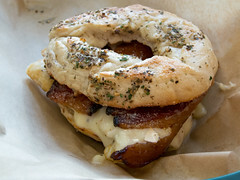 I also decided to get a breakfast sandwich, made with the same Montreal Spice bagel. The sandwich was no slouch, either: a freshly-fried egg, still with soft, tender yolk, some North Country Smokehouse bacon (in my opinion, their cob-smoked bacon is one of the finest bacons around), and some Cabot cheddar, for a really nice breakfast sandwich combination. Add in the malty flavor, the chewiness, and the spicing from the Montreal Spice bagel, and this was an awesome breakfast treat. I’m certain they are getting another visit the next time we swing through town.